Two-wheelers are abundant on the roads in our country and the chances of accidents are high. In many cases, people involved in an accident and liable to pay for damages, regardless of whether they can afford it or not. As a result, the Government of India has made it mandatory for all vehicle owners to have at least a basic third-party liability policy. Bajaj Allianz, one of the leading general insurance companies in the countries, offers three types of two-wheeler insurance policies to prospective customers. *Note: Coverage will vary based on the type of policy you purchase. When you opt for a two wheeler insurance policy from Bajaj Allianz, you stand to benefit from a number of value-added features. Get assistance from Bajaj Allianz and make instant claims through the 24x7 call centre. You will also receive SMS updates on the status of your claim. You can purchase a two-wheeler insurance policy online. You can also renew your policy in a few simple steps. You can transfer up to 50% of your existing No Claim Bonus from any insurance provider when you opt for a policy from Bajaj Allianz. Customers can reach out to the dedicated customer care helpline 24x7, even on holidays. The customer care team will be able to provide support for claims and assistance in anything required from Bajaj Allianz. Bajaj Allianz provides hassle-free inspections with high service standards. There are three plans on offer from Bajaj Allianz that cater to customers who need a two-wheeler insurance plan. This plan has a tenure of 2 or 3 years and comes with additional benefits. During the policy term, there is no change in the third-party premium. At the time of renewal, the plan offers an additional NCB benefit. If you make a claim, the NCB reduces but does not become zero. If the policyholder wishes to cancel the plan, a proportional refund will be paid. This is a short-term plan that provides insurance coverage for your two wheeler. With this plan, the third-party premium increases each time you renew the policy. If you make a claim, then the No Claim Bonus will be reduced to zero. If you cancel the policy after making a claim, then no refund is payable. This policy offers basic insurance coverage to the policyholder. With this plan, you receive a personal accident cover and a third-party legal liability cover. Thus, this policy will provide coverage if any damages are caused to a third party’s property or if an accident causes the death of a third party or bodily injuries to the third party. If your vehicle is damaged or lost completely due to natural events, the insurance plan will pay out a benefit to cover the expenses or losses. The natural calamities covered include self-ignition or lightning, fire, explosion, flood, typhoon, earthquake, storm, hurricane, tempest, inundation, hailstorm, cyclone, frost, landslide, and rockslide. The two wheeler insurance policy will also cover certain manmade disasters. These include theft, burglary, riot, strike, accident by external means, malicious act, terrorist activity, any damage in transit by air, rail, road, rail, inland waterway, lift, or elevator. The owner or driver will get an individual accident insurance cover for any injuries sustained while driving, travelling, mounting or dismounting the bike. Policyholders can also take additional cover for pillion riders and unnamed riders. For any accidental damages caused to a third party, the insurance pays for any legal liabilities as per the provisions of the plan. The insurer will cover any expenses related to accidental death, permanent injury or damage to property of a third party. *Note: The coverage offered will vary based on the type of policy you purchase. There are certain exclusions applicable under a bike insurance policy from Bajaj Allianz. Under these particular circumstances, the insurer will not be liable to pay any benefits to the policyholder. Loss or damage to accessories of the vehicle due to burglary or theft of house, not including theft of the vehicle itself at the same time. Wear and tear of tyres, tubes and other consumables, unless the vehicle is damaged at the same time. In this case, the company will pay up to 50% of the replacement cost. There are certain aspects that any insurance company will check before handing out an insurance policy. The eligibility criteria differ between companies, and also between purchase and renewal. To avail a bike insurance policy, a few requirements need to be fulfilled by the vehicle owner. Driver details - The person availing the policy should be of legal age to ride and have a valid licence. Registration - The bike needs to be registered with a Regional Transport Office (RTO) in the country. Fitness certificate - The vehicle might need a fitness certificate. Payment - Depending on the plan chosen, a premium amount will have to be paid to avail the policy. Modifications - Modifications made to the vehicle might result in insurance companies being reluctant to provide insurance cover. Inspection - Depending on the vehicle, an inspection by a representative of Bajaj Allianz might be required. Enter your name, mobile number and email address to get a quote. Once the premium payment is made, the policy will be issued immediately via email. A hard copy will be sent to your registered address within 7-10 days. Alternatively, customers can purchase or renew a policy by contacting the customer care on 1800-209-0144 or by sending an email to websales@bajajallianz.co.in. Register your claim with Bajaj Allianz online or via customer care, or at a branch. You can then send your vehicle for repair, if needed. Submit your documents to the insurer for verification. The insurance provider will verify your claim, and if approved, will settle the claim. If you are eligible for cashless claims, you need to get your vehicle repaired at a network garage. The garage and the insurance provider will deal with each other directly. You will not be required to pay for any repairs up to the extent that the policy covers. Bajaj Allianz will settle the bill with the garage. A list of network garages can be found on the Bajaj Allianz website. 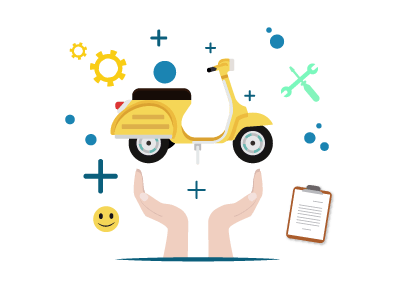 Why Deductible is important in a Bajaj Allianz Two Wheeler Insurance Plan? When you take an insurance plan, the insurer might give you an option to choose your deductibles. Deductibles are simply the amount you are willing to pay if anything were to happen to your vehicle. The insurer will pay the rest. For example, if you opt for a 10% deductible, then you will be liable to pay for 10% of the damages caused to your vehicle or a third party. The insurer will only pay 90% of the cost, to the extent of the sum assured. A higher deductible will lower your premiums, but this will also mean that in case of an accident, you will be liable to pay a higher amount. Choosing a lower deductible will increase your premiums, but at the time of claiming insurance, Bajaj Allianz will pay a higher amount. What to do if Your Bajaj Allianz Bike Insurance Plan Expires? Bajaj Allianz will send regular reminders to renew your policy so that you do not miss the expiration date. You can also set renewal reminders on their website. However, if you have missed the renewal date and your policy has lapsed, there are a few things you can do to remedy the situation. Contact Bajaj Allianz as soon as possible and seek advice as to how to go about renewing your policy. You can ask to talk to an expert through the official website, too. There might be a grace period or a reinstatement period within which you can renew your policy without much hassle. You can log on to the Bajaj Allianz official website and opt to renew your policy, and see the options they provide you with. Insurance providers generally require an inspection of the vehicle before they can renew a lapsed policy. You will need to pay the premium to renew the policy. Please note that if the insurer finds good reason, they can increase your premium payable. Bajaj Allianz provides a customer care service round the clock to address any grievances, claim settlements, queries, and complaints that customers might have. 1.If I want to sell my bike, can I transfer the insurance policy? Yes, this option is available with Bajaj Allianz. You need to hand over the relevant documents to the buyer, intimate Bajaj Allianz about the transfer, and also inform the RTO that you have sold the bike and transferred the insurance. 2.What are the documents required for renewal of my two-wheeler insurance? You need your previous insurance copy and the registration certificate of the vehicle. 3.What is Insured Declared Value? Is it important? The Insured Declared Value or IDV is basically the market value of your vehicle that has been adjusted for depreciation. IDV is important because if you choose a sum higher than the market value, you might end up paying higher premiums for no reason. If you choose a lower IDV, then your premiums come down but so will your insured amount. 4.What is a No Claim Bonus? If you do not make any claims during the policy period, then upon renewal, the insurer will give you a No Claim Bonus. This bonus is given in the form of a discount on premiums. So if you have not claimed insurance, then when you renew your policy, your premium amount will be lesser. NCB accumulated by one person cannot be transferred to another person. 5.Can I carry my insurance policy on my phone? Yes, you can get your insurance policy directly on your mobile phone by accessing the Bajaj Allianz mobile app - Insurance wallet. 6.Can I cancel my two-wheeler insurance policy during the policy term? Yes, you can cancel your two-wheeler insurance policy during the policy term. However, given that all vehicle owners are mandatorily required to have at least a third-party liability insurance cover, it is likely that your motor insurance provider will require you to submit documents to prove that you have purchased another insurance policy for your vehicle or that your vehicle’s registration certificate has been canceled by the respective RTO. 7.What are certain discounts I can avail on my two-wheeler insurance policy? Policyholders with comprehensive two-wheeler insurance policies can avail the No Claim Bonus if they don’t file claims during the tenure of the policy. Also, if you have installed security devices that are approved by the Automotive Research Association of India (ARAI), you will be eligible to receive a discount on the own damage premium. Further, if you are a member of a recognized Automobile Association, you can claim a discount on your own damage premium. Your insurer might also offer you other discounts, based on their terms and conditions. 8.Is it safe to purchase or renew two-wheeler insurance policies online? Yes, it is completely safe to purchase or renew two-wheeler insurance policies online. You can also pay your premium through secure online payment channels provided by your insurer. Purchasing or renewing your two-wheeler insurance policy online is a seamless and hassle-free process since you can complete the process from anywhere and at any time, based on your convenience. 9.What are certain exclusions under comprehensive two-wheeler insurance policies? *Note: For the complete list of exclusions, you should refer to your policy document/brochure. 10.I use my two-wheeler very rarely. Is it still necessary to purchase insurance? Yes, you should purchase a two-wheeler insurance policy for your vehicle, regardless of how often you use the vehicle. That being said, if your two-wheeler is very old or if you rarely use your two-wheeler, you can opt for a third-party liability-only insurance policy, which offers more basic coverage. Steps Involved In Two Wheeler Ownership Transfer. I have taken the two wheeler insurance policy with the BAJAJ ALLIANZ GENERAL INSURANCE because the reason is that it is the good insurance. The premium and the IDV value is satisfactory with this policy. The policy coverage is for basic and it includes the road accidents. The reason for taking the two wheeler insurance policy with the BAJAJ ALLIANZ GENERAL INSURANCE is because it is the good company than others. The premium and the IDV value is satisfactory also the policy coverage is for full insurance. I am using the two wheeler insurance policy with the BAJAJ ALLIANZ GENERAL INSURANCE where i am using it from last 6 years where i had two times claim with this policy but i am not satisfied with the claim because they have declined the claim. I have taken the two wheeler insurance policy with the BAJAJ ALLIANZ GENERAL INSURANCE and i am using it since from last 8-9 months. the premium i have paid is good and the policy is for 3 years. It is for basic policy coverage for this insurance. I have used the two wheeler insurance policy with the BAJAJ ALLIANZ GENERAL INSURANCE where i have used it for on year but i had no claim experience with this insurance policy. the premium and the IDV value is satisfactory with this policy. There is no particular reason for taking the two wheeler insurance policy with the BAJAJ ALLIANZ GENERAL INSURANCE and the documentation process is simple and good. i have no claim experience with this policy. The policy coverage is for comprehensive. I have a very good experience with the BAJAJ ALLIANZ GENERAL INSURANCE where i have experienced with this two wheeler insurance policy for more than 5-6 years. I had no claim experience but the coverage is for full with this policy. Premium and the IDV value is very good. I have taken the two wheeler insurance policy with the BAJAJ ALLIANZ GENERAL INSURANCE where the premium is satisfactory also the IDV value is god with this policy. I had no claim experience with this policy but the policy coverage is also good. There is no particular reason for taking the two wheeler insurance policy with the BAJAJ ALLIANZ GENERAL INSURANCE I have no claim with this policy. The premium and the IDV value is satisfactory with this policy. The policy coverage is for 3rd party insurance. There is no particular reason for taking the two wheeler insurance policy with the BAJAJ ALLIANZ GENERAL INSURANCE but the premium and the IDV value is satisfactory with this insurance policy. I have no claim experience with this insurance policy. I have purchased the two wheeler insurance policy with the BAJAJ ALLIANZ GENERAL INSURANCE where the documentation process is good and the premium is good also added on that the IDV value is satisfactory with this policy. The policy coverage is for basic. I am not satisfied with the two wheeler insurance policy with the Bajaj Allianz General Insurance because the premium is higher with this insurance policy. The policy coverage is sufficient but i have not experienced with any claim with this policy.